Thomas Glassford, Yisus, 2018. Lacquer on MDF, 47 7/32 x 35 13/32 inches. Thomas Glassford, Compound, 2018. Lacquer on MDF, 47 3/16 x 35 3/8 inches. Thomas Glassford installation at México Inside Out: Themes in Art Since 1990 curated by Andrea Karnes, The Modern Art Museum of Fort Worth, 2013. Photograph by Paul Moseley for the Fort Worth Star-Telegram. Thomas Glassford installation at México Inside Out: Themes in Art Since 1990 curated by Andrea Karnes, The Modern Art Museum of Fort Worth, 2013. Thomas Glassford, Untitled, 2014. 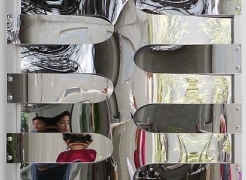 Mirrored Plexiglas and anodized aluminum, 48 in. x 41.6 in. x 2.4 in. 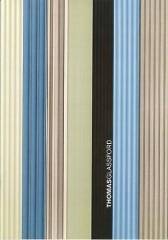 Thomas Glassford, Sherbert Stripe Partitura, 2003. Anodized aluminum, 39.4 in. x 59.1 in. x 2.8 in. 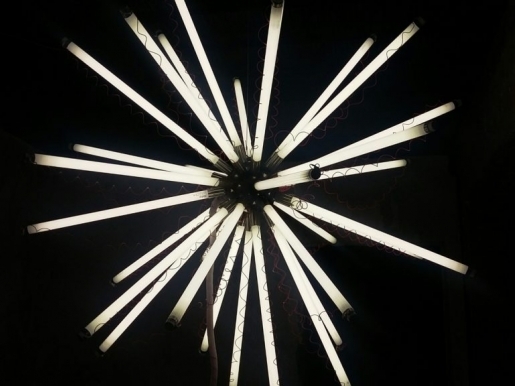 Thomas Glassford, Aster 125T5/4100 (black), 2001/2007. Fluorescent light, nickel over brass, electrical hardware, 49 3/8 in. x 49 3/8 in. x 49 3/8 in. Thomas Glassford, Still Life: Utopian Architecture Series, 2007. Anodized aluminum, aniline and melamine, 47 in. x 15.5 in. x 20.5 in. 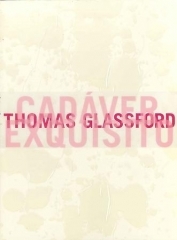 Thomas Glassford, Cádaver Exquisito (Exquisite Corpse), 2006, Museo Universitario de Ciencias y Artes, MUCA, UNAM, Mexico City, Mexico. Thomas Glassford, Event Horizon, 2003. Fluorescent light, nickel over brass and electrical hardware, Laboratorio Arte Alameda, Mexico City, Mexico. Thomas Glassford, Jungala, 2011. Installation view at ArtRio, SOLO Program, curated by Julieta González and Pablo León de Barra, 2013. Thomas Glassford, Fuente Doble, 1990. Installation view at ArtRio, SOLO Program, curated by Julieta González and Pablo León de Barra, 2013. 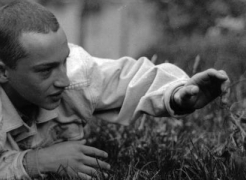 "Fragmentation speaks more clearly to the realities of our lives than the false, flat image we are accustomed to seeing. There, everything is always backwards." 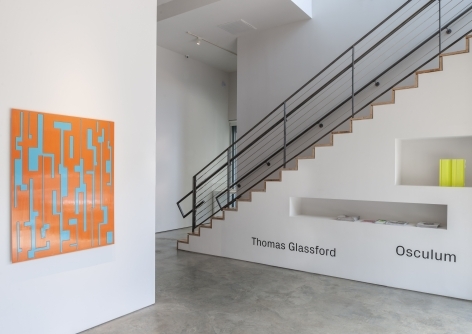 Thomas Glassford studied art at The University of Texas at Austin, where he received his BFA. He moved to Mexico City in 1990, and joined a young avant-garde of Mexican, European, and American artists living in the city. 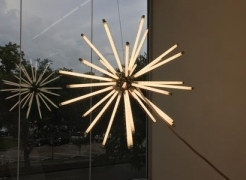 Since the early 1990s, Glassford has used everyday materials--ranging from gourds to broomsticks, anodized aluminum to melamine plates--to create architectural or installation-scale works. 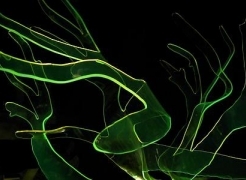 He transforms these materials into rhythmic and often abstract creations, reminiscent of Minimalist sculpture and Op Art paintings of the 1960s. Thomas Glassford | Art Ltd.